For the Sake of the Children: Cooler Schools—This was the governor’s highest priority, and legislators agreed. The $100 million appropriation will be used for air conditioning, heat abatement and energy efficiency in at least 1,000 classrooms statewide. Governing with Compassion: Taking Action on Homelessness—Legislators approved $12 million to support the state’s effort to move homeless families and individuals into stable housing. The funds will support a coordinated strategy with concrete goals to address homelessness. Creating More Affordable Housing—Substantial progress was made to meet the housing needs of the average family. Legislators allocated $75 million to provide additional support to the Rental Housing Revolving Fund and the Dwelling Unit Revolving Fund (DURF) for affordable rental housing and loans for low-income housing. They also approved expanding DURF funds for regional state infrastructure projects—considered a giant step forward in affordable housing. Working with the Community: Kalihi 21st Century Initiative—$5 million was approved for a feasibility study for a new jail facility. Legislators also funded improvements to correctional facilities statewide. In addition, the State Office of Planning will coordinate community efforts to identify state lands near rail transit stations for mixed-use development and sensible growth. 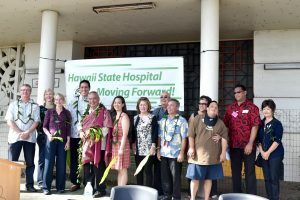 Improving Health Care—Legislators approved $160 million for a long-overdue new facility for patient care at the Hawai‘i State Hospital. They also approved $31 million in operating subsidy for Hawai‘i Health Systems Corporation hospitals statewide. An additional 20 positions for the Department of Health’s vector control branch were funded to strengthen the state’s fight against mosquito-borne diseases. Managing state resources in better, smarter ways—Governing the right way means taking care of our obligations while managing effectively. Legislators approved $150 million for the Rainy Day Fund and $81.9 million to pay down unfunded liabilities. Read more in our June issue.